37 y/o female sustained Achilles tendon rupture playing tennis. Underwent repair 5 days after injury. Sural nerve crosses near the midline at the level of the musculotendinous junction of the achilles @9.8 cm from the calcaneus. Palpable defect in Achilles tendon generally in avascular zone 3-6cm proximal to calcaneal insertion. 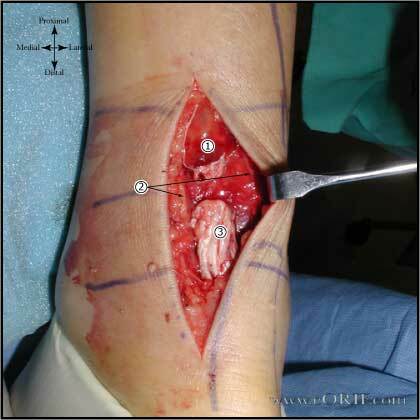 Incision along medial border of the Achilles tendon. Sural nerve is 18.8 mm from the lateral border of the Achilles tendon at the level of insertion of the Achilles into the calcaneus. Proximal stump, overlying fatty tissue and hematoma has not been debrided yet. Repair performed with 2 #2 nonabsorbable sutures (Orthocord) placed using a modified-Bunnell suture technique. Sutures were tied within the tendon to prevent bulky suture mass. Reinforced with a vertical locking circumferential 0-Vicryl suture. Repair area, note bulky suture knots are within tendon mass and overwrapped with circumferential 0-Vicryl suture. Sub-Q closed with inverted interrupted 2-0 Vicryl. Skin closed with running 3-0 Nylon suture placed in baseball stitch configuration. Placed in below-knee bulky compressive dressing with posterior plaster splint with foot in gravity equinus postion.